This fall the majority Southern Ontario anglers noticed a later start to the salmon and steelhead season. Chinook ran in bigger numbers in October and many have been hanging around until now. Steelhead action didn’t pick up until mid October once water temperatures cooled. The runs are reminiscent of how runs were a decade ago when I was a teenager. Considering the climate change we’ve endured the last decade this season seems like back to normal for me. Compared to last fall this year is better. There were far more salmon in our rivers and the steelhead run is promising (and the size is up). With the salmon run basically over we are all switching gears to steelhead and I’m excited about the season. At the beginning of the fall steelhead run most of my success came targeting swift and oxygenated stretches. These areas are prime holding grounds for steelhead early in the season before the water starts to cool. Fresh early fall steelhead hold in rapids, readily gorging on eggs, bugs and minnow-like baits as they enter the head of the pools. However, the cooler water has forced steelhead to migrate into different areas. The fast water action has almost expired. As the water cools steelhead slowly start to shift from sitting in oxygenated water on into deep, slow pools. Sections like these pools will fish best until the spring season. On the other hand, don’t be shy about fishing the deep oxygenated stuff if you aren’t having success in pools. In my opinion overlooked water is always worth a shot, even if it is not a textbook place to target steelhead during that time of the year. You’d be surprised where some of these fish can hold once the water gets ice cold. 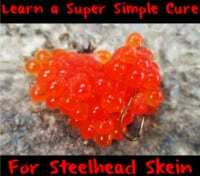 Most of my success under the float has been on scraped salmon or trout eggs doused with Orange Fire Cure. During the winter I prefer pink and chartreuse spawn netting. Fishing with bright spawn sacs in cold water grabs more attention and triggers the steelhead to move more aggressively towards your bait. In early winter good eggs is crucial to success. Once they start sitting in the deep and slow pools they slowly become lethargic. They eat less and put up half the fight they do in the fall. Slowing your presentation down in cold water helps and puts more fish on the bank. The size of the spawn sacs should almost always be tied according to water visibility (smaller sacks for clear water). However, there are days where they don’t mind the biggest of spawn sacs even in gin clear conditions. 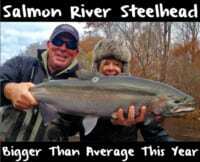 I believe steelhead action will continue to be good until our rivers ice up. There are still good numbers of steelhead running up our rivers in Southern Ontario. Judging the current weather forecast we still have relatively mild days to spend on the rivers before the cold snap. Winter is coming. Remember to dress according to weather conditions. Always pack a few extra socks and clothes in case you get wet. There is no such thing as bad fishing weather, only bad clothing. Just because it is getting cold does not mean the rivers won’t be as busy. Respect and give anglers their space on the water and remember to practice catch and release. Stay warm and play it safe out there. Here’s to a good, long winter steelhead season for everyone out there! Editor’s Note: Bojangles spends his days and (nights) targeting steelhead in Southern Ontario. To follow his adventures please follow him on Instagram at https://www.instagram.com/angle_with_bojangles/.